The Bomb Factory Art Foundation is pleased to announce their inclusion in Art Licks Weekend this October with the launch of the Takeover Series. 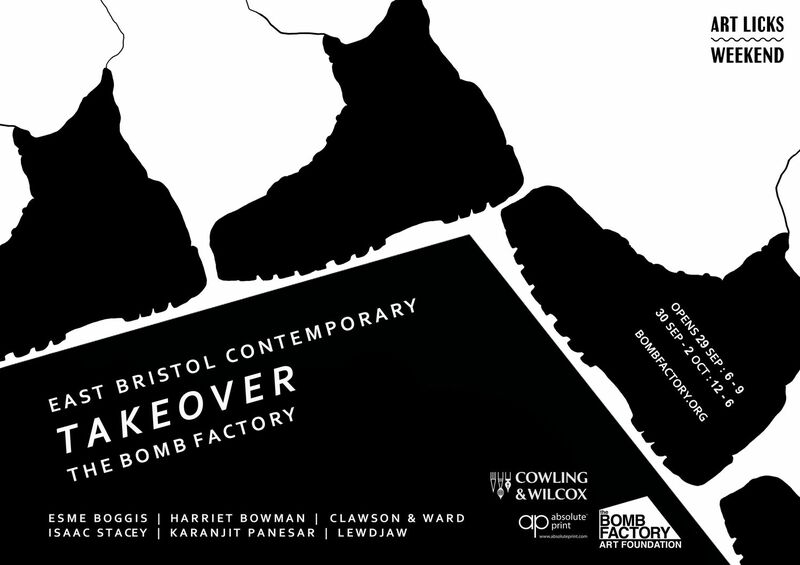 The first Takeover will be by the young artist led space east bristol contemporary who have been invited to curate an exhibition which will showcase innovative Bristol-based contemporary artists and offer London audiences an opportunity to see exciting developments in contemporary art from an established regional collective. The Bomb Factory Art Foundation believes in the creation and promotion of new and exciting developments in contemporary art by fostering relationships with other artists and collectives from around the UK and from around the world. The aim of the Takeover series is to form partnerships through the creative exchange of ideas and resources by showcasing activities of other spaces. The collective aim of the series is to create a network of organisations that promotes and celebrates the diverse UK art scene. east bristol contemporary (ebc) is an artist-led gallery based at The Trinity Centre, Bristol. ebc seeks to counteract the lack of established showing spaces for grass roots contemporary artists in Bristol, and seeks to establish a unique and diverse programme of exhibitions and events.